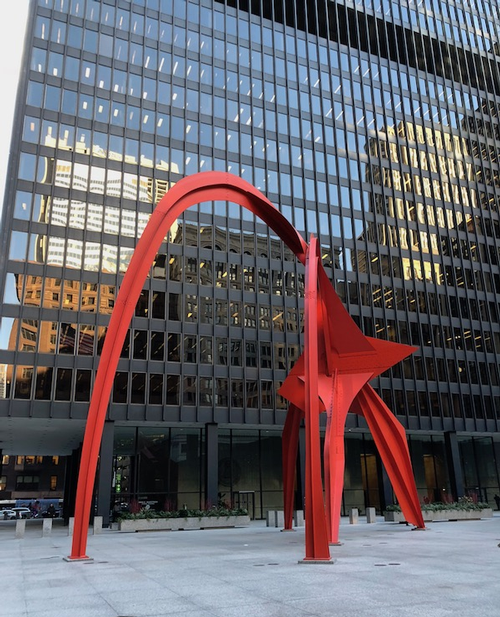 When most people first glimpse the towering, 53-foot-tall Calder Flamingo in downtown Chicago, their emotions vary. Awe is probably the most common. From a distance, it looks like a gangly spider-like thing, but you really can’t grasp the size until you get closer. Walking under and around the sculpture, is, by all accounts, inspiring. The graceful arms and breadth of the artwork are secured to the base at only five small points, giving it the appearance of floating. Flamingo was dedicated in 1974, shortly before the death of its maker, Alexander Calder, at the age of 78. Calder was an innovative American sculptor most noted for making large kinetic mobiles. As his craft developed over the years, he shifted toward fixed sculptures—which grew larger and larger—yet he strove to maintain the fluidity and “lightness” of his original mobiles. When I first saw Flamingo, on the other hand, chills ran up my spine—and not in a good way. At the time, I was on a mission to provide inspection services for the complete removal and recoating of the entire exhibit slated for the summer of 2012. It was a beautiful Chicago spring morning. The dull, deep red of the sculpture was in dark contrast to the vivid blue sky and the steel and glass of the surrounding buildings. I had the 100-plus-page specification in my hand, a camera in my bag and hesitation in my heart. As I walked around the stabile, I was lost in thought and so focused that I could not appreciate the quality of the art, but was focusing instead on its geometric complexity and the challenges associated with repainting. While I appreciated the aesthetics, I was humbled by the challenge. The geometries of the sculpture might be artistic, but they were nightmarish from a painting perspective. The bulk of the structure was made up of 3/4-inch-thick steel beams. 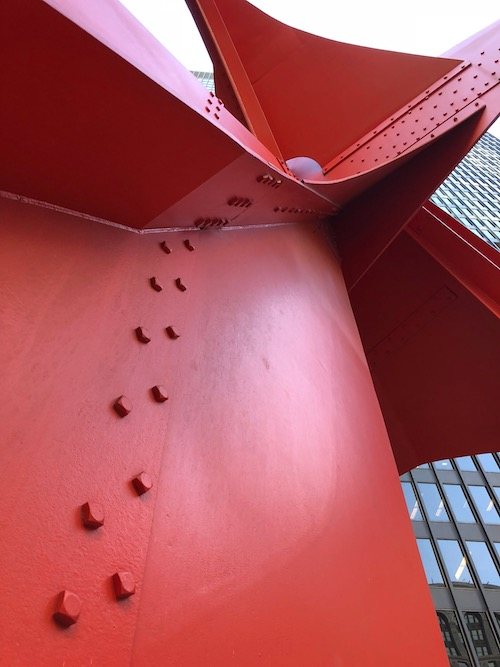 Yet, brilliantly, where the massively thick beams connected, Calder had cut the thickness of the steel down by half so the beams would blend beautifully together in a flush, rather than lapped, joint. Although elegant from a distance, it left open, linear voids upwards of a 1/4-inch wide or more, which would lead to challenges when blasting and painting. The geometries of the sculpture might be artistic, but they were nightmarish from a painting perspective. Then there were the bolts. Even though the piece was welded, there were hundreds—perhaps thousands—of bolts roughly the size of a walnut. 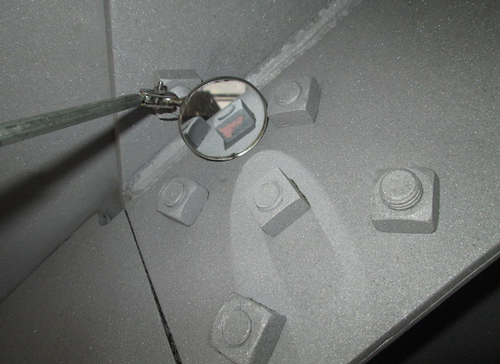 Each and every bolt, including the threads protruding from the nut, would require complete blasting to remove every speck of paint, which meant the blaster would have to position the nozzle behind every single bolt and we would have to use a mirror to peek behind each one to inspect it. The same was true for every coat of paint. The applicator would have to lean over, paint or spray behind every bolt, and we would have to inspect it. The numbers of challenges began to add up. If anything needed to be touched up, that would add another “touch” to each bolt. And then there were the edges—thousands of linear feet of edges, wending this way and that, followed graceful arcs and paths more representative of a roller coaster than a 50-ton sculpture. And while the welds were nearly perfect, I envisioned painters stripe-coating every edge and us trying to inspect them all. And unlike any other kind of industrial paint application, like a bridge or steel structures at an industrial facility, this was a national treasure—a historic work of art—and the finished project needed to reflect that in every dimension. And then there were the edges—thousands of linear feet of edges, wending this way and that, followed graceful arcs and paths more representative of a roller coaster than a 50-ton sculpture. People would come here to gaze at the delicate enormity of the piece. They would look at it from afar, in passing and up close. They might walk by absentmindedly one day and perhaps pause to run their hands over it in admiration. People would sit with their backs pressed against the base. Kids would play near it and wipe their hands on it. And, as is inevitable in a large city, people and dogs alike would urinate on it—not an insignificant fact in designing and inspecting complex coating systems. Next was the scaffolding. Not only did the entire structure need to be scaffolded to allow hands-on access, it also needed to be draped to contain dust and protect against weather. To add one additional stressor to the complexity of the project, the work was being carried out directly beneath the windows of the federal office that administered the piece. The General Services Administration Offices (which issued the purchase order) was quite literally next door. 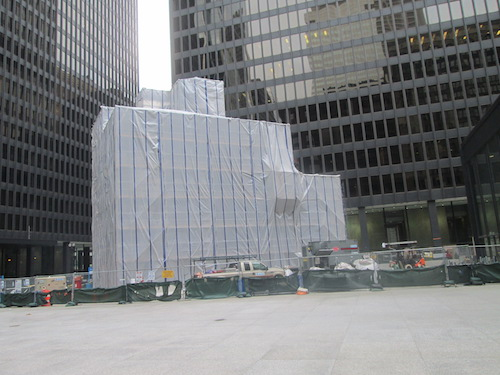 That’s right: Administration employees could look out their windows directly down into Federal Plaza and onto the sculpture and the work being done. The “first bite” in starting any painting project is the development of a specification—and this spec was a doozy. Mimicking the complexity and completeness of the sculpture, the specification was a work of art in and of itself. At more than 100 pages, it left nothing to chance and was solid. It didn’t, however, discuss the enormous challenge that had taken place much earlier to reproduce the color. When Robert Lodge of the McKay Lodge Art Conservation Laboratory wrote the specification, he first had to find a way to reproduce “Calder Red.” That’s right—the sculpture has its own unique color, which had long been discontinued. In fact, Lodge did an incredible job of detective work in reproducing the color, originally manufactured by Keeler & Long Company. Even though the piece was welded, there were hundreds—perhaps thousands—of bolts roughly the size of a walnut. And what’s more, there were three different coats, manufactured by two different vendors, requiring a total of four coats (two topcoats). 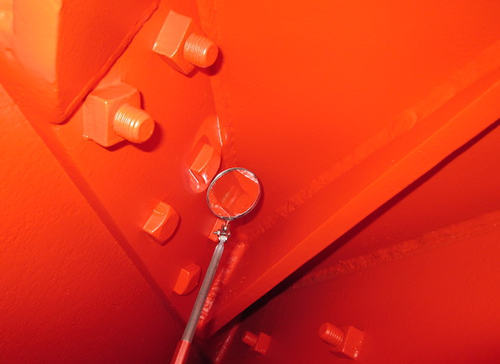 One of the core services at CCG is the identification of optimal paint systems and development of specifications. This can be highly risky from a liability perspective because, if there is a failure, fingers quickly get strained pointing blame at one another. When we specify paint systems, we always try to identify paint systems from one manufacturer. Why? Because it’s risky not to, for a variety of reasons. First, when mixing and matching paint systems from different coating companies, the specifier now takes responsibility for all aspects of how these systems interact with one another. Will adhesion be acceptable between them and, if so, for how long? Will there be any bleed-through? 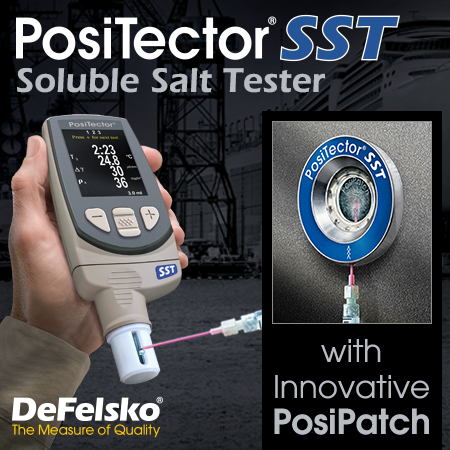 Has there been testing to ensure compatibility so, for example, a solvent in one coat won’t cause an unanticipated chemical reaction with a pigment in another? And lastly, there’s simply the liability and potential finger-pointing involved. In a typical coating failure, the two entities at odds with one another tend to be the applicator and coating company. If there’s a failure here, it would be between McKay, two different coating companies and the contractor. Not only did the entire structure need to be scaffolded to allow hands-on access, it also needed to be draped to contain dust and protect against weather. Acrylic urethane topcoat (Calder Red), 1-3 mils DFT. The final DFT for the finished work would be between 6 mils and 14 mils, roughly the thickness of a little more than a sheet of paper and a little less than four sheets of paper. For those unfamiliar with the concept of this system (which is a very typical three-coat system often used predominantly on bridges) it as follows. The organic, zinc-rich primer is designed to provide corrosion protection in two dimensions. First, it’s designed to act as a barrier coating, preventing moisture from coming into contact with the steel. But the zinc provides a second benefit by providing cathodic protection. That means, if the coating system becomes damaged and scratched down to the base carbon steel (which, in Chicago is an inevitability either through vandalism or someone accidentally riding their bike into it), the adjacent zinc will sacrifice itself and “heal” the carbon steel. When the zinc is scratched, even if the carbon steel is exposed, the adjacent zinc will provide a level of protection by corroding before the carbon steel, thus postponing the development of iron oxide (rust). 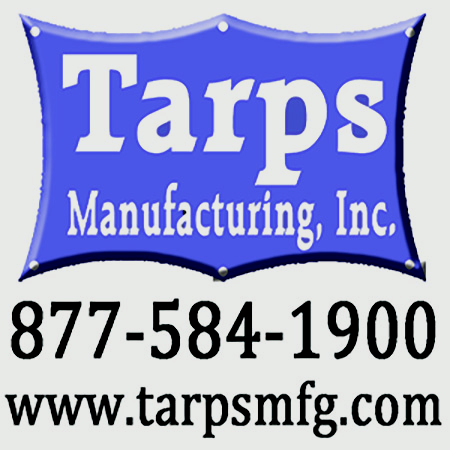 The tie-coat, or mid-coat, is typically an epoxy, which is thick, strong and durable. It adheres tenaciously to the zinc, adding an additional layer of physical and barrier protection. Each and every bolt, including the threads protruding from the nut, would require complete blasting to remove every speck of paint, which meant the blaster would have to position the nozzle behind every single bolt and we would have to use a mirror to peek behind each one to inspect it. The final coat is a more delicate topcoat and has completely different performance characteristics and rheology than the other two. In this case the urethane has exceptional color-retentive characteristics, opacity and UV stability. 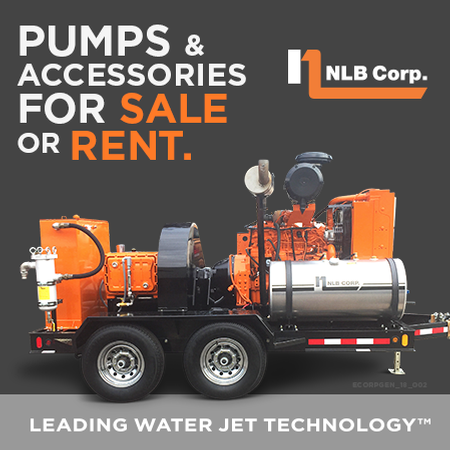 Together, they provide state-of-the-art corrosion protection and beautification—if, of course, installed properly, which is where I came in. “Bite” number two is application. In very broad terms, the concept of the work was simple. Blast to a commercial visual of (SSPC-SP 6 NACE 3) with a profile of between 1 and 2 mils. Then apply four coats of paint. But the detail of the specification and complexity of the structure and scaffolding made everything exponentially complex. Let me provide you with just one example. The sculpture sits in a large federal plaza in Chicago that gets, as you can imagine, an enormous amount of foot traffic through summer and winter. To keep people safe, the plaza is salted in the winter to remove ice. While salt is great for removing ice, it wreaks havoc on steel. So, the specification differentiated surface preparation requirements for those areas below and above two feet. Areas below two feet required an SSPC-SP 6 NACE 3, but also required the contractor to “power wash the blasted area using clean potable water at a rate not to exceed five square feet per minute.” This was to remove any chloride contamination prior to painting. Yet worked progressed, bite by bite, with all involved parties collaboratively moving forward. When Robert Lodge of the McKay Lodge Art Conservation Laboratory wrote the specification, he first had to find a way to reproduce “Calder Red.” That’s right—the sculpture has its own unique color, which had long been discontinued. 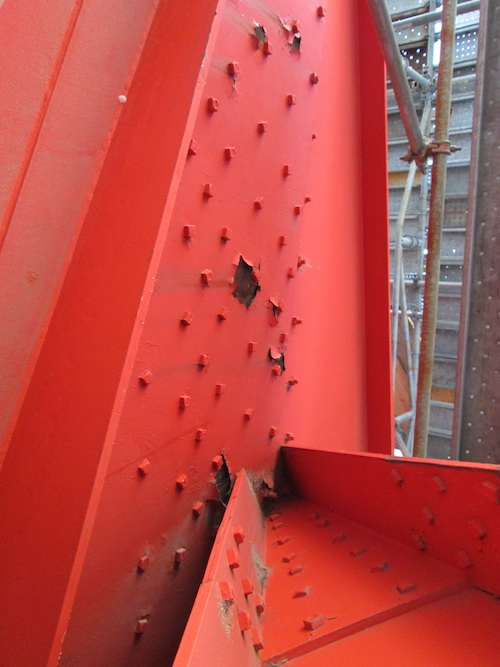 During abrasive blasting, hundreds of spots were missed predominantly behind bolts, and reblasted. Despite an impeccable scaffolding and tarping job, rain slowed things down. Equipment malfunctioned. People were cranky or late. During paint application, as is always the case, some spots were missed, and some runs were identified. All of the issues were professionally and amiably resolved, one instance at a time. And now, more than five years later, the results are both astounding and as expected. Walking up to the sculpture this time was a joy. It was red, large, delicate and stately. Upon walking closer, I could take the time to appreciate the aesthetics. And getting even closer still, I was pleasantly assured that our collective work had paid off. In my slow, methodical walk in and around the Flamingo, I could not find a single instance of rust. 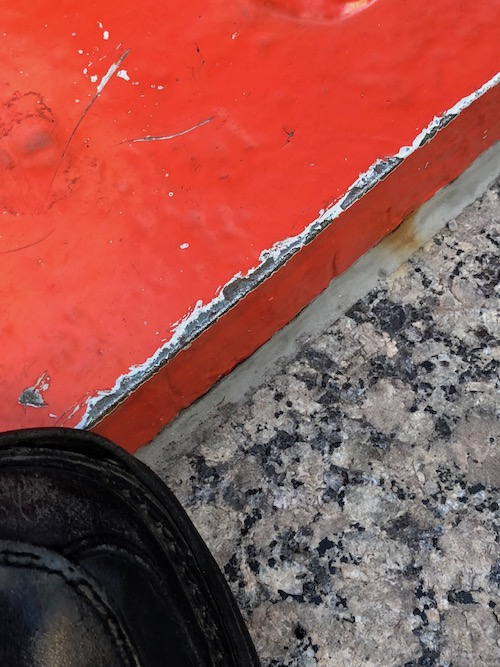 There were, of course, numerous scrapes and gouges, apparently all the way down to the carbon steel substrate, but not an ounce of rust because of the cathodic protection provided by the zinc-rich primer. The Calder Flamingo is not only a testament to a brilliant artist, but also a testament to the complex artistry of combining industrial-grade corrosion protection leading to an aesthetic which is supportive of the art. It is an organic blending of two different types of creativity combined to maintain the integrity and longevity of the stabile. Warren Brand’s coatings career has ranged from entry-level field painting to the presidency of two successful companies. 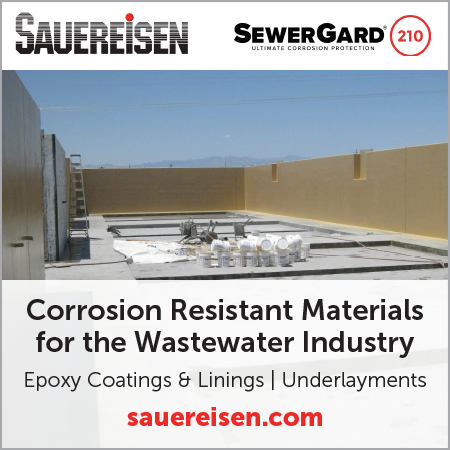 Over nearly three decades, he has project-managed thousands of coating installations and developed specs for thousands of paint and coating applications. NACE Level-3 and SSPC PCS 2 certified, Brand, an MBA and martial-arts instructor, now heads Chicago Corrosion Group, a coatings consultancy. 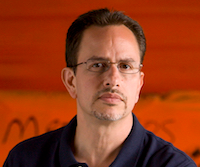 He is a JPCL contributing editor and a regular blogger on paintsquare.com.